Adapted from Archives of Ysleta del Sur Pueblo, 2003, Volume 5, “Tigua Indian Scouts in Defense of the Pass of the North – Three Centuries of Service” page 175-182. Note: Images and photographs have been added to this Internet revision. Also include: Tigua Military Service Chronology (1854-1885). Ysleta del Sur Pueblo was important to the defense of the El Paso del Norte region during the Spanish (1680-1821) and Mexican (1821-1848) periods and the early American era (1848-1881). Tigua warriors helped protect the settlements of the El Paso district and travelers along the Camino Real from southern Chihuahua, Mexico, north to the El Paso district. By the 19th Century, Spain utilized Pueblo militias to augment frontier defense. This policy replaced the previous one that excluded Indian participation (Simmons 1965:247). Tigua scouts served at the presidios of El Paso del Norte and San Elizario. Colonial authorities called Indian scouts Indios exploradores (Simmons 1965: 217). "The standard complement, as prescribed in Spain's Royal Regulations of 1772, was a captain, one or two lieutenants, ensign, chaplain, and forty-three soldiers, including a sergeant and two corporals, plus ten Indian scouts" (Timmons 1988:108). end holding bows & arrows) were scouts for the Mexican military. 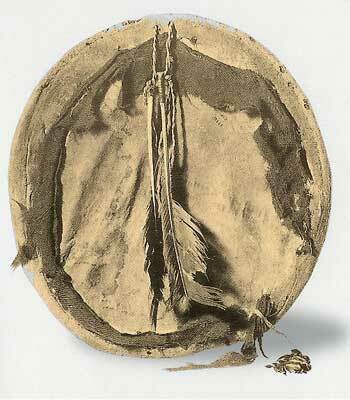 leather jackets (adormed with military medals), moccasins and the warcaps (the emóh ) and U.S. Military. 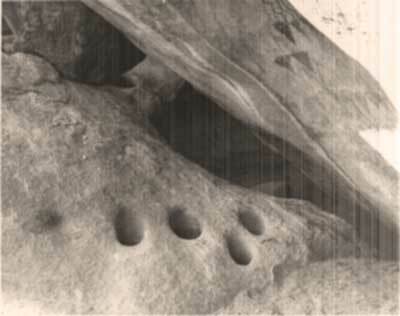 Photo Courtesy of Arizona State Museum. The Tigua of Ysleta Pueblo assisted Spanish troops in quelling the Manso and Suma revolts of 1684-86 in the El Paso region. 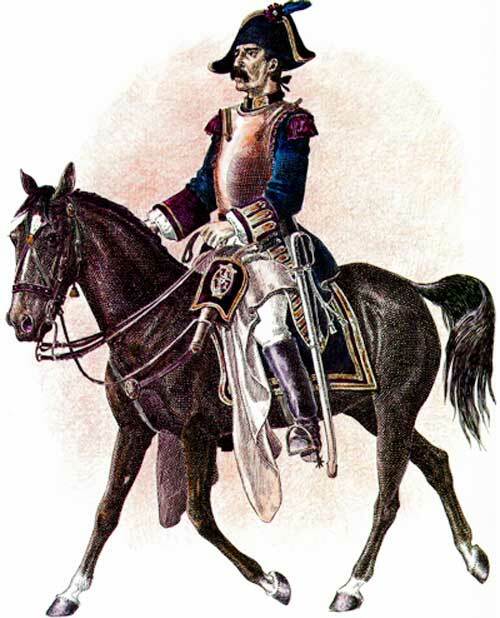 In 1692, Tigua auxiliaries accompanied Governor Diego de Vargas in the re-conquest of New Mexico. 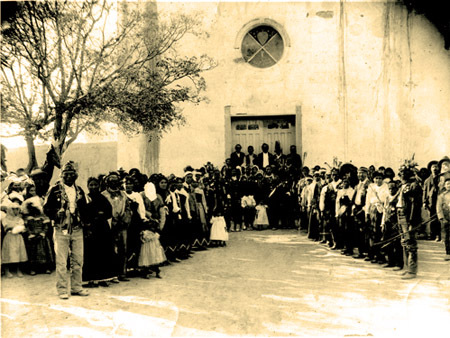 In that year, the governor initially intended to transfer the Tigua and Piro Indians from the temporary El Paso settlements to their home pueblos in New Mexico (Espinosa 1940:287). Later that year, he decided to permanently maintain them in the El Paso district to strengthen the region’s security. Moreover, de Vargas knew that to return them to their former pueblos would make them vulnerable to Apache and Navajo incursions. 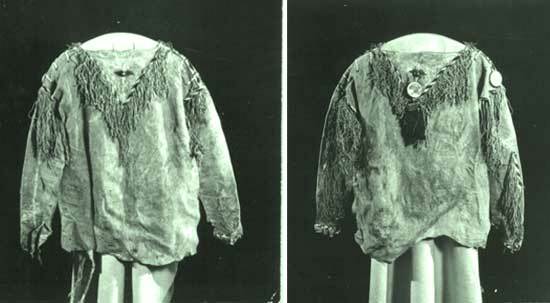 "War Jacket of Mariano Colmenero, Scout and Tribal Governor"
The green tan deer skin jacket was made prior to 1880. 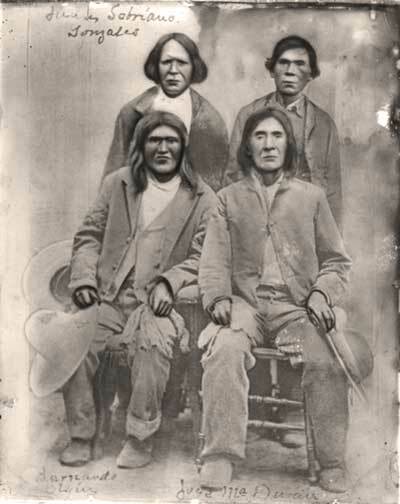 In 1747, Pueblo Indians of El Paso participated in the Spanish campaign against the Gila Apaches. In that year, Captain Rubín de Zelis led a force of sixty Pueblo auxiliaries and fifty Spanish soldiers in a successful operation in the Hueco Mountains that resulted in the capture of fifty-three Apaches (Jenkins 1989:51-52). In September 1793, a force of 75 troops with a compliment of 40 Indians patrolled El Paso del Norte to thwart a threatened attack by Apaches who had abandoned the peace camps at Janos and Carrizal with the intention of an attack on San Elizario (Hendricks 1994:172). The Tigua of Ysleta del Sur Pueblo and the Piro of the adjacent pueblos Senecú del Sur and Socorro del Sur protected the El Paso district from Apache attack during the Spanish and Mexican periods. The three pueblos continued to do so in the late 18th century with the arrival of raiding Comanches and Kiowas. Following Mexican independence in 1821, the Tigua continued to assist the military commanders at the San Elizario Presidio to protect the area from marauding Indians and bandits (Campbell 1950; Phillips 1931). On June 25, 1835, Julian Bernál, Prefect of El Paso, favorably responded to a request by the Tigua Tribal Governor, Ygnacio Durán, that the Indians be partially excluded from an order, which protected the state tobacco monopoly and directed that all prohibited tobacco be publicly destroyed. Bernál agreed to Duran’s petition that the Indians be permitted to smoke tobacco when on a scouting party. The prefect recognized the exemption “for the very poor class of natives as for the other inhabitants of this town who are sacrificing themselves constantly in the honorable career of arms in pursuit of the enemy…” (Campbell 1950:60-61).